“Army researchers have designed a computer model that more effectively calculates the behavior of atmospheric turbulence in complex environments, including cities, forests, deserts and mountainous regions. This new technology could allow Soldiers to predict weather patterns sooner using the computers at hand and more effectively assess flight conditions for aerial vehicles on the battlefield. Turbulence may be invisible to the naked eye, it is always present around us in the air in the form of chaotic changes in velocity and pressure. Traditional computational fluid dynamics methods of analyzing atmospheric turbulence treat the fluid as a continuum, solving the nonlinear Navier-Stokes differential equations that are involved. However, calculating the turbulence in the planetary boundary layer, the lowest layer of the atmosphere, can be difficult due to how the presence of trees, tall buildings and other aspects of the landscape directly influences its behavior. TCFD methods must account for all effects of the neighboring points surrounding the target, which creates an immense computational load that is very difficult to implement efficiently on modern parallel architectures, such as Graphics Processing Unit accelerators. As a result, these methods often face challenges when confronted with more intricate environments due to limitations in treating complex surface boundaries. In an attempt to search for an alternative approach, a team of U.S. Army Research Laboratory scientists led by Dr. Yansen Wang turned to the field of statistical mechanics for ideas. What they found was the Lattice-Boltzmann method, a technique used by physicists and engineers to predict fluid behavior on a very small scale. Unlike TCFD methods, the LBM treats the fluid like a collection of particles instead of a continuum and has been widely used in fluid simulation to accurately portray fluid dynamics. Wang and his team determined that this new approach could accurately model atmospheric turbulence while requiring much less computation than if they had solved for the NS differential equations. This fundamental change essentially allowed them to disregard a huge chunk of the neighboring points on the grid model, cutting the number of neighboring behaviors to account for and significantly lessening the computational load. As a result of their investigation, the researchers used the newly developed multi-relaxation-time Lattice-Boltzmann method to create an advanced Atmospheric Boundary Layer Environment model, which specifically treated highly turbulent flow in complex and urban domains. This marks the first time that an advanced MRT-LBM model has been used to model the atmosphere. 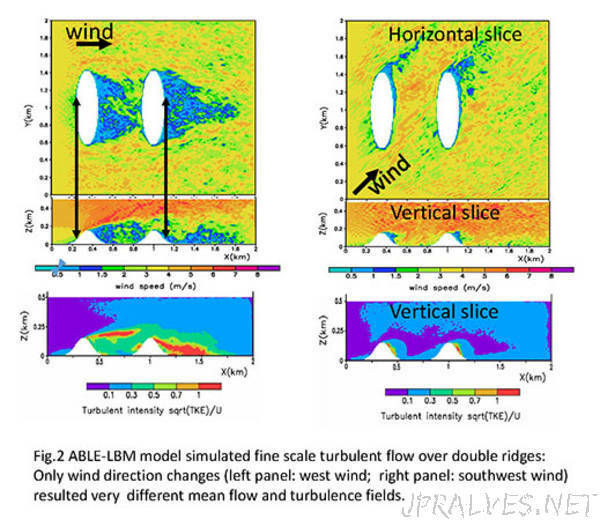 The newly developed ABLE-LBM model paves the way for a highly-versatile approach to atmospheric boundary layer flow prediction. In addition to providing faster operating speed and simpler complex boundary implementation, this approach is intrinsically parallel and thus compatible with modern parallel architectures, making it a potentially viable modeling method on tactical compute platforms for the U.S. military. The development of the ABLE-LBM model has significant ramifications on many other aspects of Army operations besides weather forecast. Atmospheric turbulence can significantly affect the behavior of optic and acoustic waves, which directly impact what Soldiers can see and hear. It can act as an important factor in reconnaissance and change the path that a laser travels or how sounds are emitted from a system. Small unmanned aerial systems are also at the mercy of turbulence vortices, which can occur when a gust of wind hits a building. Knowing how the turbulence will behave can help sUAS avoid collisions and even take advantage of existing updrafts to fly without their propellers to save energy. Potential applications can also be found outside the military in civilian life. Better knowledge of boundary layer turbulence can assist in civil planning in both preparation and emergency response when dealing with chemical spills, industrial fires and other man-made or natural disasters. Details of this breakthrough are described in the paper, “Simulation of stratified flows over a ridge using a lattice-Boltzmann model” by Yansen Wang, Benjamin T. MacCall, Christopher M. Hocut, Xiping Zeng and Harindra J. S. Fernando in the journal Environmental Fluid Mechanics (available online at https://doi.org/10.1007/s10652-018-9599-3).